Oolong Supreme is a tea that I had been eyeing at DavidsTea for a long time but it is fairly expensive in comparison to the less expensive options like Cream of Earl Grey or Santa’s Secret. 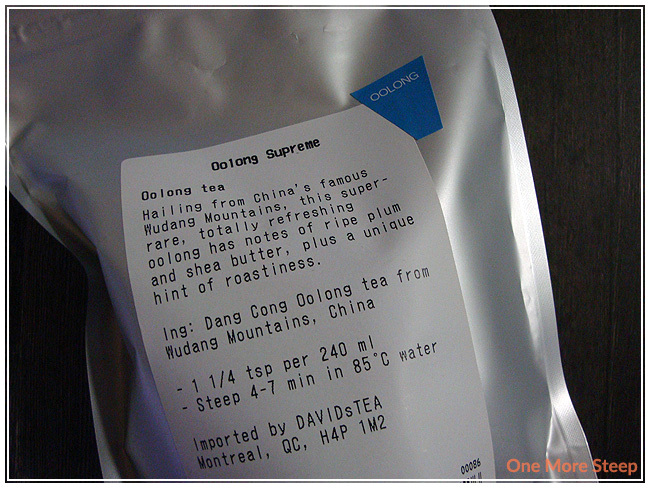 The description of Oolong Supreme states that the tea is Dang Cong Oolong tea from the Wudang Mountains of China. It’s a bulky tea, it’s a much larger bag than what I’m used to for 50g of tea from DavidsTea. I picked out Oolong Supreme as a reward with my frequent steeper points. The tea leaves from this tea are amazing, the dry leaves are huge! They have this beautiful fruity smell, which reminds me of a mix of apricots and plums. DavidsTea recommends steeping in 85°C (185°F) for 4 to 7 minutes. I did the first steep for close to 3 minutes (as per the Tea Association of Canada) instead as I felt 4-7 minutes was a long time. 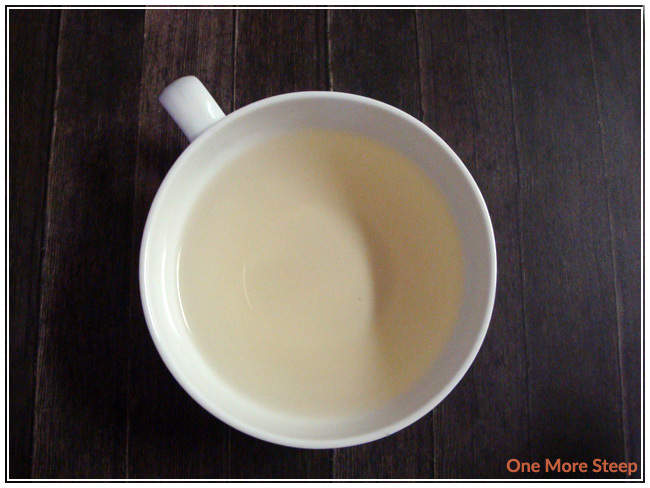 Oolong Supreme steeps to a pale yellow with a very mild aroma. It smells very much like the dry leaf – plums and apricots! It has a mild sweetness that mingles well with the taste of plums and apricots. The description of Oolong Supreme mentions notes of shea butter and “roastiness” which I can’t seem to find, but that’s okay because this is just the first steep and I will be trying at least one more steep. No bitterness or astringency to note, Oolong Supreme is a nice smooth cup of fruity oolong tea. Surprise, surprise, Oolong Supreme resteeps well! 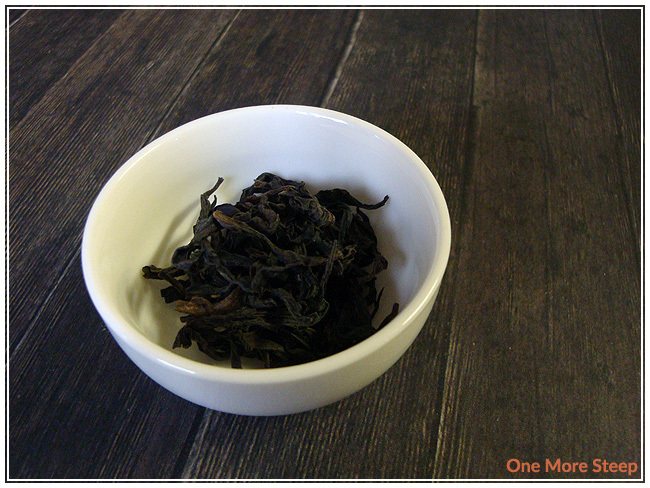 I resteeped Oolong Supreme a total of five times (so six steeps with the same leaves). Each time I used water that was about 85°C and I added an extra minute or so for each subsequent steep. The flavours developed with each steep, I feel that the flavours were the boldest with the second and third resteep. There was a stronger sweet fruity taste with each resteep – definitely more apricot than plum by the end. The sweetness doesn’t get too strong that it overwhelms the fruit flavours as they develop, they grow a bit bolder together. Try as I might, I didn’t find the shea butter or roastiness in the tea for any of the resteeps. The fifth resteep was when the flavour began to be less strong. I loved DavidsTea’s Oolong Supreme. The smell of the dry leaf is just how the tea tastes like after steeping, and the tea leaves do amazingly well with resteeping – as one might expect from a good quality oolong. In total I steeped the same leaves six times and got five wonderful steeps out of. The flavours really developed with each steep as the leaves would unfurl just a little bit more and I think it’s a great time to have if you have the time to resteep and appreciate the changes in the flavour. This is definitely not the type of tea that you would steep once and throw the leaves away – that would be a terrible waste! While Oolong Supreme is on the pricier end of DavidsTea’s product collection, I think it’s a wonderful addition to your tea stash if you happen to like oolongs. If you’re unsure about oolong tea and you do live near a DavidsTea, you can opt to purchase a small amount just to try (I’ve gone as low as asking for 10g in a little baggie) or you could use your frequent steeper rewards on this tea if you’ve hit 100 points in a redemption period.